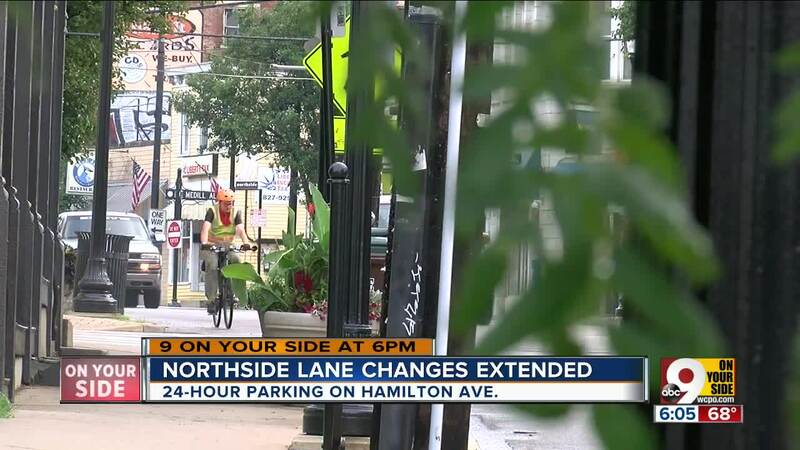 CINCINNATI -- A monthlong project studying the traffic impact of 24-hour parking along Northside's Hamilton Avenue business corridor ended nearly a week ago, and some residents are already calling for the new parking rules to continue. Prior to May 12, parking along Hamilton Avenue was restricted during the morning and afternoon rush hours, allowing for two lanes of travel inbound toward Uptown and Downtown in the mornings, and two lanes back out to the more residential neighborhoods in the afternoons. For the last month, though, the city's Department of Transportation and Engineering lifted those restrictions, allowing parking on both sides of Hamilton Avenue all day, every day . The goal: to see how all-day parking would decrease speeding and potentially impact traffic congestion on Hamilton Avenue and nearby streets. Both the DOTE and Cincinnati police have identified the stretch as a hot spot for crashes, and a DOTE-administered online survey found residents see speeding as a big problem throughout Northside's business district. Fred Neurohr, vice president for the Northside Community Council, said he -- along with his colleagues on the council -- are eager to see the city's findings, and he recommended that DOTE leave the parking restrictions lifted for a longer test period. His main argument for keeping the looser parking restrictions: It didn't seem to impact traffic all that much, he said. Neurohr said his commute traditionally did not include Hamilton Avenue, but he began using the road more regularly once the test began. "Frankly, I didn't notice any changes," he said. "I saw the delays with the pipe replacement (construction work on Hamilton), but I didn't get stuck anywhere coming or going." But Neurohr wanted to know if his experience matched other Northside residents'. He created an online survey to gauge how others -- both Northside residents and people who may not live there but use Hamilton Avenue regularly -- saw 24-hour parking's impact on traffic through the business district. "The community has some strong opinions on this. As a research guy, I could give DOTE something they could use on the matter," he said. His survey collected more than 300 responses in the week it was circulated toward the end of the test program. Ninety-seven percent of those who took the survey said they use Hamilton Avenue several times a week, with about two-thirds saying they use the road at least daily. Roughly two-thirds of the respondents saw no change or minor delays to traffic flow. Another reason for maintaining the current parking rules, Neurohr said, is to see how things might be different once school starts again. "A lot of the traffic through our neighborhood are people from points north going to Cincinnati State and (University of Cincinnati)," he said. Resuming the test once school starts in the fall was always part of the plan, but Neurohr said it's not worth the manpower spent reinstalling the signs, only to take them down again come September. "Our recommendation was, since it's not causing anything notable traffic-wise, and I've seen in the news that we have a major deficit in the city, why send your people out to put up the signs, just to take them down again?" he said. In a June 12 letter to DOTE officials, the Northside Community Council formally expressed its unanimous support for continuing the parking test through September. But Neurohr said the council also wants to see the data the city collected first and get a fuller measure of the broad impact on connecting streets' traffic, as well. Until then, the council will hold off on judging whether the change should be made permanent. 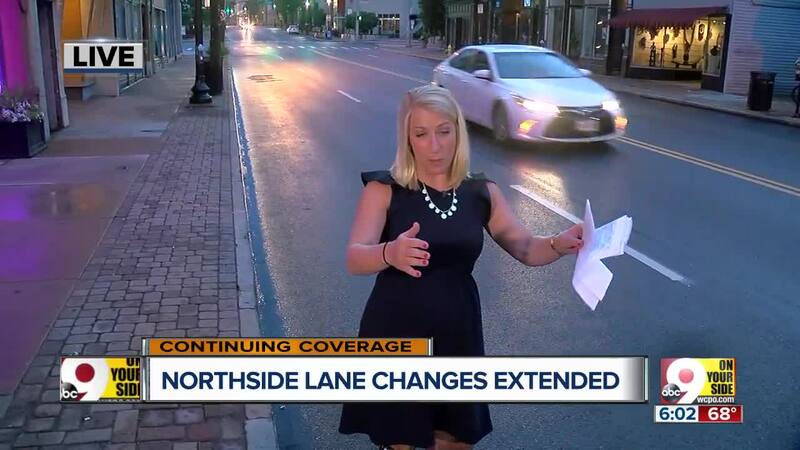 In an email to WCPO, the city's interim Communications Director Casey Weldon confirmed that DOTE officials received the NCC's letter and plan to engage the neighborhood for feedback later this summer. "We agree it makes sense to extend the full-time parking pilot project until October. A few parking restriction signs may have inadvertently been reinstalled this week, but we are working to ensure they are removed as soon as possible," Weldon said. Weldon said a final decision will wait pending engagement with the neighborhood on this issue. Meantime, Neurohr said the NCC will continue to work with the DOTE, which he referred to as a "good partner" throughout the process. "We're going to keep open communication with DOTE as a council. Hopefully they'll come talk to us at the next meeting," he said. The Northside Community Council's next meeting is scheduled for 7 p.m. July 16 at the McKie Recreation Center on Chase Avenue.